Yeah it was funny how it went! We really looked at it as fostering. 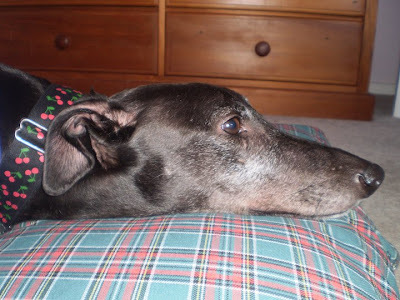 Mynx stayed on very plain food so she didn’t get spoilt for a new owner – our own greyhound George (Chile Command) was horrified because he had to have the same. I kept thinking what sort of home she should go to, and decided it should be somewhere she’d never have to encounter anything that stressed her, with humans who would have patience to give her space and time until she found her confidence. I even rang Sanson for permission to flea-treat her because she wasn’t mine to decide. Meanwhile she started to do a happy dance when I got home, and greeted me when I woke up each morning with snuffly little head-nudges…. then one morning I was walking both George and Mynx and found myself thinking what collars and pj’s she should have. The gentle leader headcollar brought a huge change in her behaviour on walks and I saw that she was enjoying herself instead of panicking at everything. Once I knew she could really be happy with us, the decision was made. She really is the sweetest little girl and I couldn’t imagine life without her. Now, Mynx has well and truly settled with us, making herself at home on the various dog beds round the house, as these photos show. She and George get on well and are happy to share most things – except treats like chicken skeletons and lamb flaps. Two dogs really has been just as easy as one. Her behaviour with our three cats is excellent, and they adjusted quickly to us becoming a two-dog household. She is very playful with stuffed toys, and George plays with the toys more often since she arrived – it’s hilarious watching them watch each other while they play. She will make off with slippers, scarves, dressing gowns, and anything she can get her paws on when I’m folding the laundry, and at least once a day we have to retrieve things from the deck and garden. Mynx bonded with me very quickly when she arrived as a foster dog, and it wasn’t long before I realised I just couldn’t be without her and that she was very happy living with us. Her confidence out and about has continued to increase and using a gentle leader has made a tremendous difference. I’ve found a couple of parks that are enclosed enough to let her off-leash, which gets a very joyful reaction.